The unlucky skull warrior does as ordered and clears out 3 of the 5 remaining traps, making the spears come out of the walls, without being hurt himself. The last 2 in the corridor do not fire when he touches them. He keeps moving into the room, waling over one of the trigger points as he goes. "It's just a lot of empty shelves, and it stinks of mould. There's nothing here. Can I come back now? Please?" "It looks the ogres took everythinf of value in this damn place. Let's get to the villlage and meet with Maju ?" "Hey, Misty Man, why don't you go look at what's there before declaring there's nothing here?" "Be careful with your words, Yuan-Cheng." Jaali still thinks that YC's idea is good, even if he didn't like his choice of words. He will go in the hallway to explore the room. OOC : As a player, I thought that was very funny. Misty Man floats down the hallway, The Skull warrior sees this as an invitation to come back out again. He steps on one of the unsprung pressure pads and there is a definite creak, but no spear emerges from the wall. The skull warrior moves back down the corridor. Misty Man enters the secret library. Obviously the skull warrior is blind, or unable to float up on the ceiling, because there is still a scroll here. It's stuck up on top one of the shelves, right in a corner. 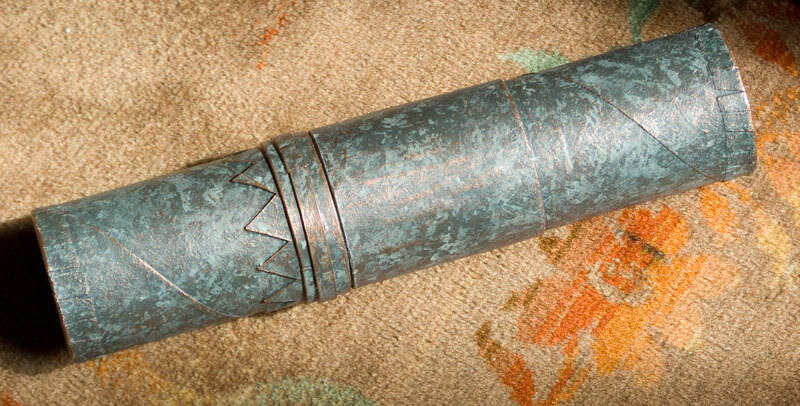 It's a pretty fancy looking old scroll case, too. "Yuan-Cheng ! I think we have a liar with us ! And what do we do with liars ?" I'll let Yuan-Cheng intimidate the guy for a while if he feels like it and then call him to come get the scroll. Yuan-Cheng throws the liar back into the room. "I wonder what would happen if you went up his nose as a mist and then turned back to your regular self. I don't think he'd like that very much." He then avoids the trapped tiles that haven't gone off yet and retrieves the scroll. "Shall we all head back to Teruk's village now?" I wasn't lying! I couldn't see! It was up too high! The big monk leaps over the remaining trap and gets the scroll down from up high. OC - Are you leaving now? I'll give it a day, then assume you all are, and I'll tell you what happens when the eagle comes back...or, if you open the scroll-case. That would suits me well, Longman. "Kanya, I have a little gift for you that I found in the temple. I thought you may appreciate it more than me. It was hanging in Ishkath belt, it may be pretty powerful. Here it is..."
Jaali then gives one of the ceremonial knife he found in the village temple to Kanya. DM: OOC - Okay. Just so I understand correctly - you are giving Kanya a ceremonial dagger you stole from Teruk's tribe, and then telling her it came from Ishakt's belt of skulls? Absolutely ! Jaali want to gets Kanya's trust (and is wounded right now) but isn't sure about telling Kanya where he got the knife. She could tell the villagers, he does think. Last edited by mTeasdale on Sat Apr 09, 2016 9:28 am, edited 1 time in total. I'm ready to head back, taking the captives with us.